I remember in my college days needing to memorize the spectral color sequence. The acronym ROY G. BIV was used to spell out Red, Orange, Yellow, Green, Blue, Indigo, Violet. This is the progression of the visible spectrum from longer to shorter wavelengths of light. I’m not quite sure why you need to know that, but for astronomers who need to measure exact frequencies of starlight, it’s important basic stuff. 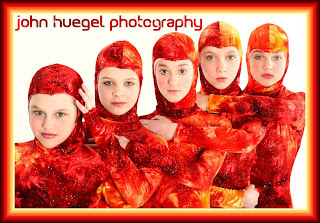 When I edited this image of these five dancers, the acronym came back to me. Red, Orange and Yellow are very strong in this image. A bit of creative titling and border borrowing colors and textures from the girls’ costumes rounded this one out. This entry was posted in colors, Dance by admin. Bookmark the permalink.